Have you ever gotten a call from an out of town friend informing you they are now in your town and want to come over? Or your kid tells you they need to bring a dish to share at their Girl Scout/Boy Scout/Camp Fire Girl/Boy’s & Girl’s Club meeting? And the meeting is in a couple of hours? Yeah, thought so. This is the kind of dish that is easy to put together with items from your pantry and freezer, and it comes together very quickly. I always make sure to have certain items in my pantry or freezer at all times. 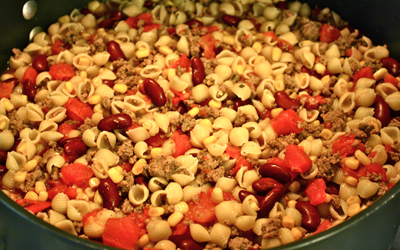 These include dried beans, canned beans, canned or frozen corn, pasta of different shapes and canned tomatoes. My freezer always has at least a pound of ground turkey, which doesn’t even need to be thawed to be cooked into a pasta sauce or a pot of chili. This month Smart & Final is promoting their First Street Brand. This brand covers everything from cooking utensils to cheese, meats, pasta and so much more. In fact, Smart & FInal is giving away five First Street VIP Bags every week in May, which are chock full of $50.00 worth of First Street products. All you have to do is “Like” their Facebook page, then click on the First Street Contest tab to enter. 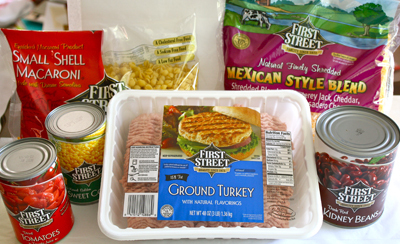 I picked up some First Street products to develop a recipe using pasta or beans. I’m not an either/or kind of gal, so I made a dish using pasta AND beans! I often use First Street products, whether for my home or for my business. I know the quality is outstanding, and the price is even better. Using just the grocery items above along with some spices I was able to make a large quantity of kid friendly and crowd friendly food. And it is a one pot meal, so clean up is easy too! What more can you want? Seriously? You cook everything up in a pot. . .
Top it with cheese and bake. Voila! This is what I call a pantry staple meal. Keeping items such as pasta, canned beans, corn and tomatoes on hand means a meal is only moments away. In a large pot of salted boiling water, cook the pasta until slightly undercooked. Preheat the oven to 350 degrees.While the pasta is cooking, heat the olive oil in a large oven proof pot over a medium high flame.Add the turkey, chili powder, salt, cumin, oregano, garlic and onion. Stir to distribute the spices. Cook the turkey 5-7 minutes, until browned.Add the tomatoes with their juice, the corn and beans. Bring to a boil then reduce to a simmer while the pasta finishes cooking.Add the pasta and stir well. 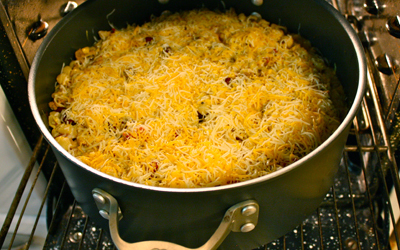 Remove the pan from the heat.Sprinkle the cheese evenly over the top of the pasta, and place the pan into the oven. Bake the pasta for 20 minutes, or until the cheese is melted and slightly browned. * Smart & Final is giving me with a monetary stipend for developing this recipe. Any and all opinions expressed are my own and are not influenced in any way by the manufacturer/PR firm. Great idea! 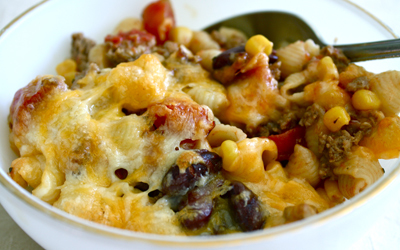 I like to use this style of chili bake with brown rice pasta (food sensitivities- but it actually provides great bite! ), add spinach and an onion and leave the cheese for garnishing. Love it! Nope, you can’t have enough of these fast and tasty recipes. Thanks for sharing this one, it looks scrumptious. My usual go-to panic recipe is a pan of chicken enchiladas, or a BIG taco salad or pot of tortilla soup. What a delightful dish! Really nourishing. Oooh this looks awesome. It’s like a Turkey chili pasta bake! Yum love the addition of corn in here too! It looks so yummy! I wonder if I could get my picky kids to eat it? I think I will have to try;). I love easy-to-make dishes like this! Perfect for when I don’t have a lot of time to spend in the kitchen.